International Anti-corruption Day on 9 December aims to stem the scourge of corruption through awareness raising. 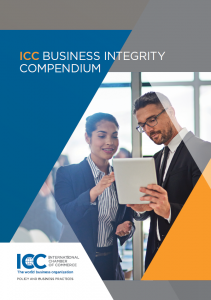 To join the celebration of doing business with integrity, ICC has launched a comprehensive Business Integrity Compendium to reinforce responsible business conduct around the world. In Belgium, we co-organised with the Belgian National Contact Point for the OECD Guidelines for Multinational Enterprises, Eurochambres and Unioncamere a celebration of the United Nations Anti-Corruption Day 2017 with a seminar in Brussels entitled “Supporting SMEs Against Corruption” gathering speakers from different Members States including representatives of the UN, the European Parliament, the European Commission, Eurochambres, ICC Belgium, the Belgian company Schréder and the partners of ACTS, an anti-corruption project co-funded by the Internal Security Fund of the European Union. 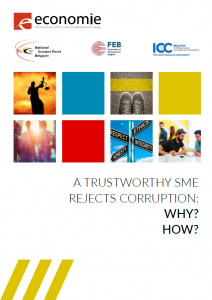 As small businesses often lack the capacity and financing to afford robust compliance programmes, a new informative brochure for small business, prepared for the Belgian Ministry of Economy has been launched at the occasion of the event, available in print and online in three languages: A trustworthy SME rejects corruption: Why? How? (also in French and in Dutch). 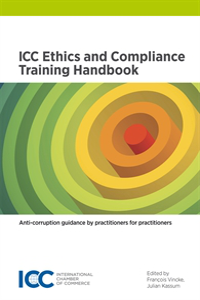 Further, the ICC Commission on Anti-corruption and Corporate Responsibility has launched today the Compendium a free one-stop-shop for anti-corruption and supply chain due diligence tools which aim to reinforce the capacity of companies both large and small to tackle corruption. Corruption continues to blight the global economy and is estimated to divert more than 5% of global GDP on an annual basis – yet it often goes unnoticed. Through integration of strategic compliance programmes that contribute to a culture of integrity across company departments, locations and sectors, business continues to play a vital role in tackling corruption in all forms. From trainings on compliance and negotiation techniques to anti-corruption e-learning platforms and more, ICC’s global network of national committees has kept busy raising awareness of the practical tools that make up the compendium. ARGENTINA: As ministers from all over the world head to Buenos Aires for the World Trade Organization (WTO)’s 11thMinisterial Conference (MC11), ICC Argentina will meet with the Global Alliance for Trade Facilitation– an initiative by ICC, the World Economic Forum (WEF) and the Center for International Private Enterprise (CIPE) – to discuss how the WTO’s Trade Facilitation Agreement (TFA) can help fight corruption through customs automation. AUSTRIA: Recognising the importance of training youth on anti-corruption practices, ICC Austria has hosted several lectures at universities in Vienna on international negotiations techniques in the last couple of weeks. ICC Austria also partners with institutions in Bulgaria, Russia, Turkey and China to host seminars on compliance programmes, money laundering and the role of antitrust law in enforcing anti-corruption tools. BRAZIL: On 4 December, ICC Brazil launched its Commission on Corporate Responsibility and Anti-corruption. To mark the launch, 12 CEOs of multinational companies including Siemens, Natura, SAP and 3M, gathered for an honest discussion on how the private sector can help rebuild Brazilian credibility. COLOMBIA: ICC Colombia and the United Nations Office on Drugs and Crime (UNODC) are hosting a forum to review progress from their partnership campaign, which promotes a culture of integrity based on international legal frameworks. COSTA RICA: On the eve of Anti-Corruption Day, ICC Costa Rica hosted a conference with high-level representatives from the national prosecutor’s office, alongside Michael D. Padula of Carlton Fields Miami & Washington, and Sara M. Holzschuh of Dentons US. Tackling issues related to gift and hospitality, corruption and entertainment, the conference also looked at proactive strategies to avoid ‘finding yourself in the hot seat’. View the full programme in Spanish. CROATIA: Addressing the intersections between corporate compliance and the latest trends in non-financial reporting, ICC Croatia is hosting a conference today in Zagreb. On the theme “Strengthening the Integrity of Croatian Companies in Fighting Corruption – Challenges of Corporate Compliance“, the event takes place in cooperation with the Croatian Chamber of Economy and the Embassy of the Kingdom of Norway. Speaking at the conference alongside high-level officials from the Croatian Ministry of Justice, Luka Burilovic, Chair of ICC Croatia, will announce plans to roll out compliance trainings on the ICC Business Integrity Compendium in the Adriatic region, in collaboration with other ICC national committees. FRANCE: ICC France is helping companies adapt to strengthened legal frameworks on anti-corruption under the ‘Loi Sapin II’ (Sapin law II), investigating in particular the new law’s implications for small and big businesses operating abroad. Following a training on 23 November the next training, another training — providing attendees with a certificate upon completion – will take place on 19 December. IRAN: In celebration of a recent agreement between the Tehran Chamber of Commerce and a local university to launch a private-sector self-assessment tool on anti-corruption efforts, ICC Iran will join representatives from the Iranian government, NGOs and the private sector at the chamber, on 9 December, to explore how technology can boost implementation of the anti-corruption tool beyond Tehran. NETHERLANDS: Building on a successful introduction of ‘Integrity Week’ in 2016, ICC Netherlands is branching out its week-long outreach campaign and Integrity and Anti-corruption Conference for international participation. More than 200 participants are gathered in the Peace Palace in The Hague today, to gain insight from speakers including Richard Bistrong, a formerly prosecuted sales and marketing executive, Jan Hommen, former CEO of both KPMG and ING Bank, Emily O’Reilly, European Ombudsman, and Roel Nieuwenkamp, Chairman of the OECD Working group on Corporate Social Responsibility. PANAMA: The Panama Chamber of Commerce is set to host a breakfast meeting, “All United Against Corruption”, on 12 December. ICC Panama will actively participate in the multistakeholder discussions which aim to propose concrete mechanisms for the public and the private sector on how to contribute effectively to the fight against corruption. SWEDEN: On 9 November, one month ahead of Anti-corruption Day, ICC Sweden held a seminar on “Responsible business and anti-corruption”. 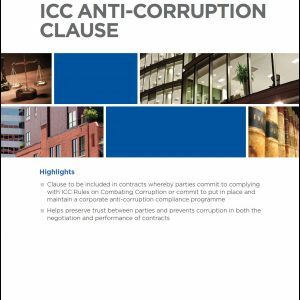 Vinge law firm, which recently translated ICC’s Anti-corruption due diligence guide for third parties, highlighted the importance of rolling out anti-corruption programmes for all employees. The seminar also explored how e-learning platforms can help employees act with integrity. UNITED KINGDOM: In support of ICC Netherland’s “Integrity Week”, ICC United Kingdom is leveraging social media efforts to raise awareness and support the digital outreach throughout the week of 4 December. This year, ICC played an active role as network partner in the B20 responsible business conduct and anti-corruption working group. The commission also hosted meetings in Mexico City on 8 March, ahead of ICC Mexico’s Latin-American Anti-corruption Congress.